while attending a local sporting event. Steph grew up on a farm south of Minden. Brock, while born in Hastings, grew up in Ottawa, KS until moving to Minden his senior year of high school. Steph and Brock were married nine years ago while Brock was stationed in Enid, OK. They have two daughters, Madilynn and Myla. Brock is a broker, specializing in farm and ranch sales and management. Steph is a third grade teacher. "We both moved away in the mid-90's and moved back here in May of 2010," said Brock. "Our decision to move back was many years in the making. We had always talked about how great it would be to raise kids in a small town. Then "Life Happens." "When I separated from the Air Force I had the opportunity to join a large commercial real estate investment firm in Omaha. Next thing we knew we were fully engaged in city life and living the grind. I absolutely loved my career and Steph and I both enjoyed Omaha, but we knew something was missing. We missed the family and community values a small town helps provide. We wanted the opportunity to raise our girls in a smaller community, be closer to family and enjoy a slower pace of life. It is now a comforting feeling to know who our kids are going to school with and who our neighbors are." "When we started looking for the right opportunities to allow us to move back here I began to notice there was a definite opportunity to transfer my corporate real estate background into farm and ranch sales and management. Very similar to what all rural communities are experiencing, there are not a lot of young people coming back to their hometowns to farm, take over a business or start new ones. I found the same thing true regarding farm sales. There is not a young person in the state of Nebraska specializing solely on ag real estate. Rural Nebraska also gave Steph the chance to accomplish something she always wanted to do as well, teach in a small school." "Honestly Steph and I looked at other communities in South Central Nebraska. While all the towns we looked at had their positives and negatives, Minden kept resurfacing as our top pick. Probably the combination of our comfort level of growing up here, having friends and family already here, there was available housing and really a decent selection of retail and services." "To this point we are really enjoying the slower pace and the people in the community. I also had the opportunity to help on the farm a little this past year and got to experience my first harvest, which was a blast. We like the fact that when you go to the grocery store or to the coffee shop you see people you know and people know you. 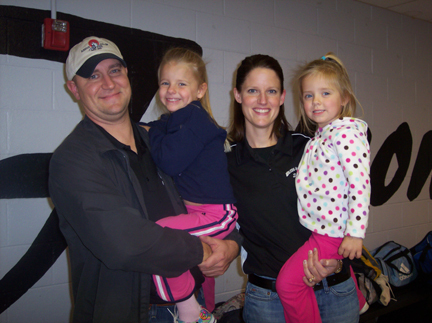 We enjoy going to community events and watching high school athletics." "We like seeing the citizens come out and support the events going on around town. There are always community events for all ages. From MAADays, the Christmas pageant, to the county fair, there always seems to be good community events to get involved with." Read more testimonials from 20 to 30 year olds who have moved back to Minden. Outstanding Schools- Marcy Brandt moves her kids back to attend Minden Public Schools. Cost of Living- Rebecca Riese finds housing and cost of living are more affordable in a small town. Agriculture Opportunities- Family and farm bring Zac Carlson Back Home. Recreational Activities- Jessica Dorn enjoys Minden's recreational activities. Rural Living- Dustin Schwenka enjoys Minden's rural setting. Entrepreneurial Opportunities- Natalie Janda finds Minden a great place to start a business. Find resources to help you make the move back to Minden.